To explain how GPS works, it's probably best to discuss first the GPS satellites which orbit the earth several thousand miles above its surface. 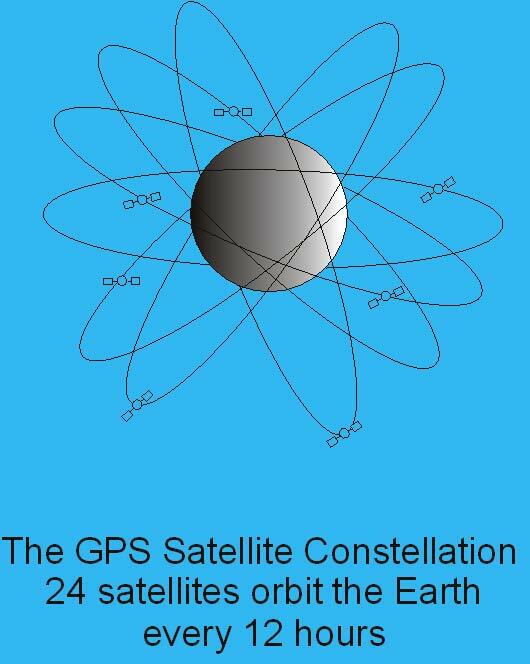 This "constellation" as it's called, consists of (at least) 24 satellites which communicate via radio waves with your little GPS receiver, sending location information as necessary to compute your position. Each satellite knows its own location, and sends that to your receiver. 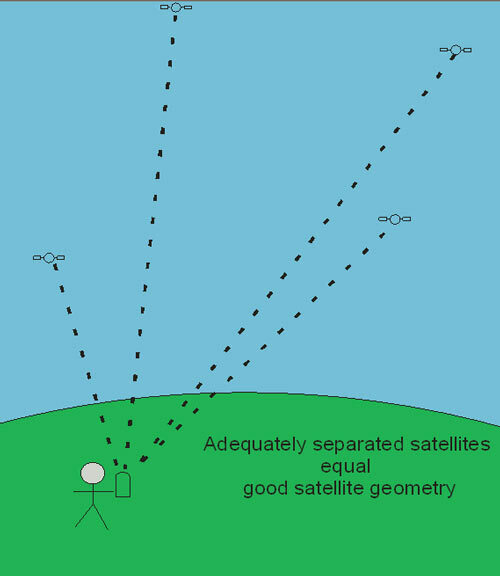 Your receiver uses the information from at least three--preferably four--satellites to "triangulate" your position. It does this in part by measuring the distance from where you are to where each satellite is. This distance is determined by how long it takes the radio signal to get from each satellite to your receiver. The whole process can get fairly involved, but essentially what's happening is your GPS receiver--which is also a marvelous little computer--digests the information from three or four satellites, and uses that information to compute its own geographic position. I say "three or four satellites" because with three satellites you can get what is known as a "2-D fix" and with four satellites you can get a "3-D fix." A 2-D fix shows latitude and longitude, but it doesn't give elevation. A 3-D fix gives latitude, longitude, and elevation. Further, the lat/long coordinates you get from a 2-D fix are not as accurate as those from a 3-D fix. A 2-D fix is accurate to within maybe 100 meters, but it could be off by hundreds of meters. A 3-D fix can be accurate to within 10 or 15 meters. Unfortunately, the elevation you get from a 3-D fix can be off by several hundred meters, although it is most often accurate to within about 15 meters. If you need accurate elevation information, don't rely on your GPS. Use an altimeter for the best elevation readings. Oh, and one other thing. Your GPS gives you very accurate time. Use it to set your watch by. This means "obtaining a position fix," which can be either 2-D or 3-D. Your GPS will give you your latitude and longitude, or it will probably be able to state your position in one of any number of grids you select. 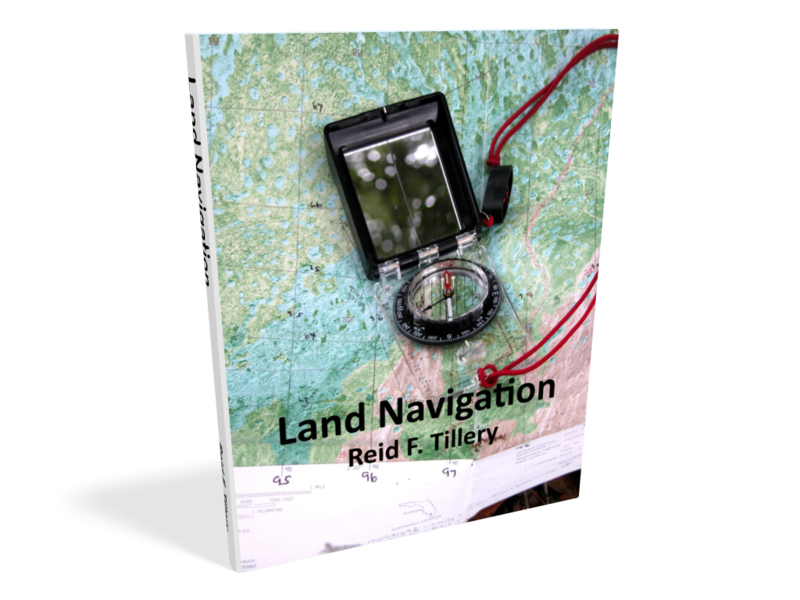 A GPS designed for your car may be limited to just latitude and longitude, but one designed for wilderness travel should be "settable" to one of any number of grids. For example, if you're using the UTM grid, set your GPS to UTM, and your position will be stated in UTM coordinates. Want MGRS? No sweat. Your receiver can probably handle that too. To give you a fix, your GPS needs a clear view of the sky. 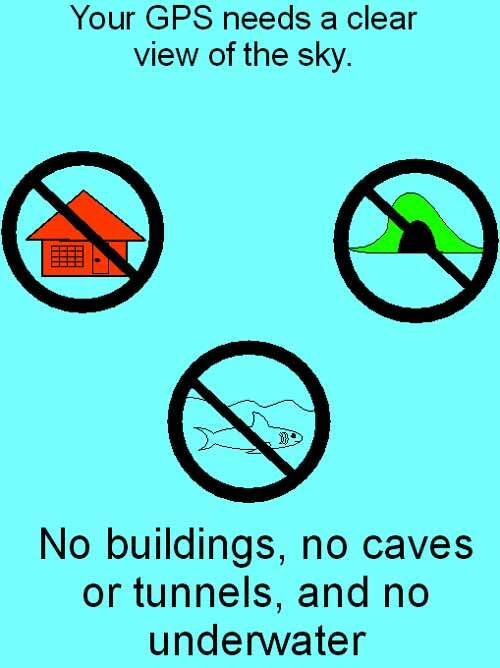 It won't work in a building, in a tunnel or a cave, or underwater. To get a good fix, the datum setting on your GPS must be set to coincide with the datum applicable to any map you might be using. So, what's a datum? It's a model of the earth, which as you may know, is not a perfect sphere. Actually, the earth is 23 nautical miles fatter at the equator than it is from pole to pole. Think of a slightly squashed basketball. To compute your position, your receiver uses whatever datum you tell it to use. If your map is based on one datum, and your receiver is set to another, any coordinates taken from the receiver and plotted on the the map most likely won't be accurate. Your position plot could be off by hundreds of meters. There are dozens of different datums (data?) but here in the USA at least you need only a few. In the UK or on Europe's continent you may need one specific to your country. The same is true, I suppose, in other parts of the world. WGS84 -- The World Geodetic System of 1984 is to the best of my knowledge the most universal datum of all. Most marine charts are based on this datum. And it may be the default datum in your GPS. NAD83 -- Some say the North American Datum of 1983 is essentially identical to WGS84. I've read conflicting reports by cartographers on this idea. Apparently, they are very similar but not exactly interchangeable. NAD27 -- Most USGS topo maps that I've seen are based on the North American Datum of 1927. If using a paper map along with your GPS, you'll likely find in the map's margin the datum on which the map is based. As emphasized above, be sure to set your GPS to this same datum. Getting an accurate fix from your GPS receiver depends on the quality of information the receiver gets from the satellites. If the satellites are properly dispersed (i.e. you have good "satellite geometry"), good triangulation can take place and your fix is likely to be highly accurate. On the other hand, if the satellites the receiver uses to compute the fix are too close together (i.e. you have poor "satellite geometry"), the fix will be less accurate. 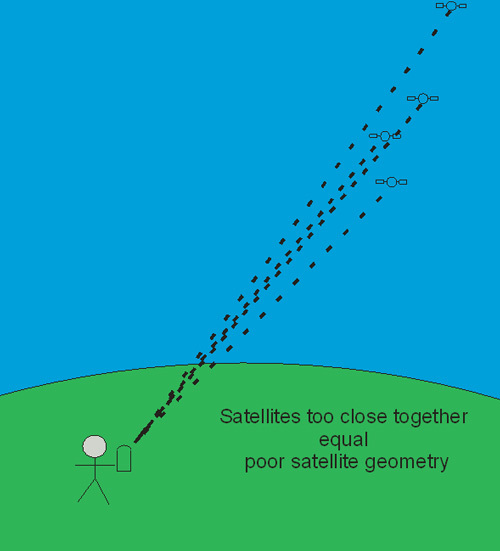 Poor satellite geometry can increase position error by hundreds of meters. If the satellites are too close together, your receiver may not lock on to them period, meaning you'll get no fix at all. At this point, you have a temporary "outage" of GPS service, but since the satellites are constantly moving, with new ones coming into view all the while, satellite geometry is constantly changing, and you'll probably get a good fix after a few minutes' wait. Once while boating in the Everglades backcountry, for instance, I could get no signal at all for about 20 minutes or so. I was on the wide, open water of Whitewater Bay so there was nothing obstructing my GPS's view of the sky. But after those few minutes, my little Garmin did deliver to me an accurate position fix. Your GPS, by the way, will probably indicate how accurate any fix is by reporting to you the "Estimated Postion Error," or EPE. When GPS first came out, the US military was concerned that enemies would use it against us. They therefore downgraded the accuracy of GPS for civilian use. Whereas the military got fixes accurate to within maybe 10 meters, civilian fixes might have been off by anywhere from 15 to 100 meters. For a variety of reasons, Selective Availability was turned off on May 1, 2000, so civilians now get the same GPS accuracy now as does the military. Other than poor satellite geometry discussed above, errors in fixes can come from a number of sources. Radio waves from the satellites can be bent by the atmosphere, causing up to 4 meters of error. Signals can bounce off buildings, mountains, and other obstacles, creating what's known as "multi-path" errors in the radio signals used to triangulate your position. Sometimes, in mountainous areas where the receiver's view of the entire sky is somewhat obstructed, it's hard to get a signal at all. That said, trees overhead aren't usually a problem for modern 12-channel GPS receivers. Errors with regard to the satellites' exact position or errors in the satellites' atomic clocks can cause errors up to about 2 meters. The "Wide Area Augmentation System" uses some extra satellites and some ground stations to improve GPS's accuracy. "WAAS" as it's called, increases GPS accuracy to within about 3 meters. To use WAAS, your GPS receiver must be "WAAS enabled" and you must turn on your receiver's WAAS function. The WAAS function uses more battery power so you may not want it in a wilderness situation where batteries may be limited. Besides, how often does a wilderness traveler need accuracy down to 3 meters? 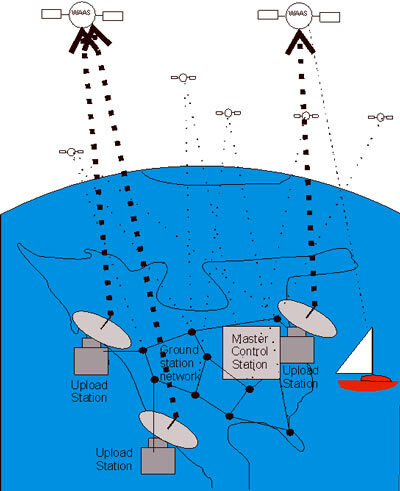 The US Coast Guard set up a "Differential GPS" system using ground stations in addition to the satellites. DGPS--used mostly by mariners--requires a separate receiver and antenna. DGPS accuracy is to within 3 to 5 meters. You can't use DGPS and WAAS at the same time. WAAS, I believe, has obsoleted DGPS. Most GPS receivers can store hundreds of "waypoints" and dozens of "routes." A waypoint is a specific spot on the earth marked by your receiver. Normally, you mark waypoints so you can return to that spot or travel to that spot for the first time. You the user decide when and where to mark waypoints. 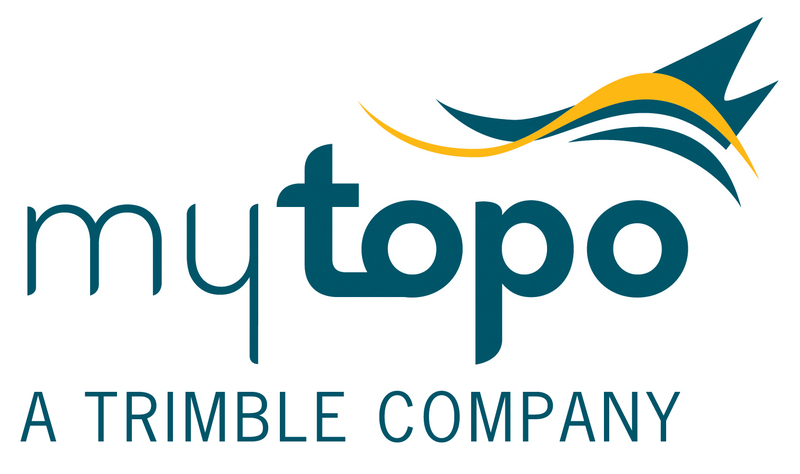 You might mark a waypoint during your travels, or you might mark waypoints while at home before you embark on any particular journey. A route is simply a collection of waypoints you choose to string together. If you want to travel say from Miami to Atlanta, you can simply mark Atlanta as a waypoint in your GPS and go to it. If, however, you want to pass through Tallahassee along the way, you'll need to also mark Tallahassee as a waypoint, then string those three cities together to create that specific route to Atlanta. Sometimes while traveling you'll want to avoid going someplace. In the Ocala National Forest near where I live, for example, there is a Navy bombing range. I certainly don't want to wander into that area, so I could set up in my GPS what is called a "proximity waypoint." My GPS would then warn me if I got to within some prescribed distance of that spot. 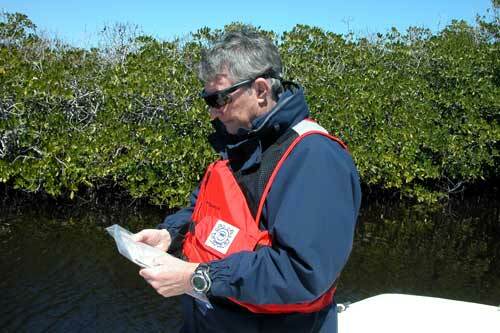 Boaters make good use of proximity waypoints to help them avoid shoal waters. If they get too close to the shallows, a GPS alarm goes off. If their receiver is hooked to a loudspeaker, the alarm is heard all round the boat. Let's say you're walking through a swamp on a dark night, and you want to return to your Jeep parked alongside an east-west swamp road. The swamp is filled with obstacles and deep-water areas with large alligators. You painstakingly made your way north through the swamp in the daylight, but now it's dark and you need to return to your Jeep. You could just follow a southerly compass course back through the swamp, but finding your way at night through the obstacles and around the deep water would be much more challenging than doing so in the daylight. But lucky for you, on the way out you left your GPS turned on and set it to record your exact tracks as you made your way along. So, now when you're ready to return you can just follow your exact tracks back to your Jeep. Your GPS left for you an electronic "breadcrumb trail."